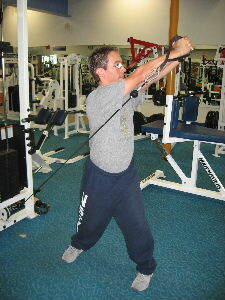 Cable lifts are one of the best functional training exercises for the core. Functional training is simply a philosophy that says that the exercises that you include in your workout should prepare your body for everyday function and activity. Our spines must move in many different directions, so it is important to perform core exercises in a variety of positions and with a variety of movements. We are most vulnerable to injury when our body twists or rotates, so by including twisting, rotational, and lifting movements in your workout you can prepare your body for everyday activities or athletic activities. Below are pictures for how to perform cable lifts. Starting Position: Position the cable machine so that the resistance is near the floor. Stand parallel to the machine with your feet facing forwards. Grip the handle with both hands. Form: While keeping your arms straight, rotate your body and lift your arms up towards the ceiling. Hold briefly at the top and then slowly lower to the starting position. Personal Trainer Tips: Keep a slight bend in your knees and elbows so that you do not completely lock those joints. Move in a slow and controlled fashion. Focus on turning from your waist. Perform 12-25 repetitions on one side and then repeat on the other side. Functional training exercises are important for developing overall core strength and preventing lower back pain. Our bodies are generally most vulnerable to injury when we twist or rotate. By including the cable lifting motion in your core workout, you will better prepare your body and lower back for functional tasks and athletic activities. 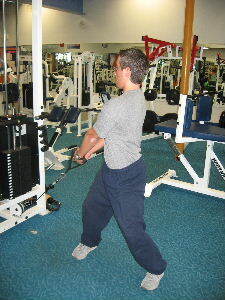 Cable chops are also a great cable exercise for the core. 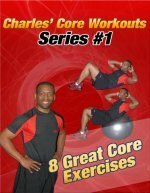 Visit the Directory of Abdominal and Core Exercises to learn More Functional Training Exercises for the Core.